S-adenosyl-l-homocysteine hydrolase (SAHH) is the only eukaryotic enzyme capable of S-adenosyl-l-homocysteine (SAH) catabolism for the maintenance of cellular transmethylation potential. Recently, biochemical and genetic studies in herbaceous species have obtained important discoveries in the function of SAHH, and an extensive characterization of SAHH family in even one tree species is essential, but currently lacking. Here, we first identified the SAHH family from Populus tomentosa using molecular cloning method. Phylogenetic analyses of 28 SAHH proteins from dicotyledons, monocotyledons, and lower plants revealed that the sequences formed two monophyletic groups: the PtrSAHHA with PtoSAHHA and PtrSAHHB with PtoSAHHB. Examination of tissue-specific expression profiles of the PtoSAHH family revealed similar expression patterns; high levels of expression in xylem were found. Nucleotide diversity and linkage disequilibrium (LD) in the PtoSAHH family, sampled from P. tomentosa natural distribution, revealed that PtoSAHH harbors high single-nucleotide polymorphism (SNP) diversity ( π = 0 . 01059 ± 0 . 00122 and 0 . 00930 ± 0 . 00079 , respectively ) and low LD (r2 > 0.1, within 800 bp and 2,200 bp, respectively). Using an LD-linkage analysis approach, two noncoding SNPs (PtoSAHHB_1065 and PtoSAHHA_2203) and the corresponding haplotypes were found to significantly associate with α-cellulose content, and a nonsynonymous SNP (PtoSAHHB_410) within the SAHH signature motifs showed significant association with fiber length, with an average of 3.14% of the phenotypic variance explained. The present study demonstrates that PtoSAHHs were split off prior to the divergence of interspecies in Populus, and SAHHs may play a key role promoting transmethylation reactions in the secondary cell walls biosynthesis in trees. Hence, our findings provide insights into SAHH function and evolution in woody species and also offer a theoretical basis for marker-aided selection breeding to improve the wood quality of Populus. In plants, animals, and microorganisms, transmethylation reactions are commonly involved in modifications of almost all metabolites. In most methylation reactions, S-adenosylmethionine (SAM) is the methyl group donor used by all organisms, and S-adenosyl-L-homocysteine (SAH) is formed as a by-product of the reaction after the methyl group donor is transferred to acceptors [1, 2]. SAH is a strong product inhibitor of SAM-dependent methyltransferases and is hydrolyzed by S-adenosyl-L-homocysteine hydrolase (SAHH) to homocysteine and adenosine, which is the only eukaryotic enzyme capable of SAH catabolism. In addition, the enzymatic activity of SAHH is related to the ratio of SAM to SAH; the accumulation of SAH inhibits SAHH activity, thereby reducing both the methylation status and gene expression. SAHH was first described as a single enzymatic entity by de la Haba and Cantoni , although researchers have known since 1955 that SAH undergoes enzymatic breakdown when incubated with crude rat liver extracts . In the same year, SAH was chemically characterized as the product derived from SAM via transmethylation , a reaction first revealed by the pioneering studies of Cantoni and Scarano . To date, full-length SAHH has been isolated from many microorganisms, including the archaeon Sulfolobus solfataricus , Saccharomyces cerevisiae, Trypanosoma cruzi, and Chlamydomonas sp. ICE-L [8, 9]. In addition, GhSAHH from Gossypium hirsutum, CsSAHH from Cucumis sativus, and SAHH from Volvariella volvacea have been cloned in plants [10, 11]. Several mutants created by an SAHH deficiency have been characterized from various plant species. For example, tobacco plants expressing an SAHH antisense transgene exhibit abnormal floral organs, stunted growth, and delayed senescence . A point mutation in the Arabidopsis SAHH1 was expressed abnormally with slow growth, low fertility, and poor germination . Antisense expression of SAHH in petunia is associated with delayed flowering, increased leaf size, and higher seed yield . Although biochemical and genetic studies in herbaceous species have obtained important discoveries in understanding the function of SAHH, the functions of other SAHH family members in even one tree species remain unknown. In trees, a marker-assisted selection (MAS) strategy is essential to dissect complex traits into their genetic components to further improve conventional tree breeding [15, 16]. Linkage disequilibrium (LD)-based association studies, also known as LD mapping, are an effective approach of providing an understanding between complex quantitative traits and underlying genetic variation in natural or breeding populations . Previous studies have demonstrated that LD mapping can be used to identify allelic variations associated with quantitative traits, such as those pertaining to wood property, disease resistance, and drought tolerance [18–20], suggesting that the new approach plays a particularly useful role in forest tree breeding programs. For example, 27 significant single-marker associations across 40 candidate genes in three composite traits were found in black cottonwood . In addition, a recent study showed that nine significant single-nucleotide polymorphism (SNP) associations from six genes with diverse roles in cambial development associated with wood or growth traits were identified in a discovery population of Corymbia citriodora subsp. variegata . In the present study, Populus was used as a model to address the structure, function, and evolution of the SAHH gene family in trees. Using molecular cloning method, we first identified two SAHH family members (PtoSAHHA and PtoSAHHB) from a cDNA library of mature xylem from Populus tomentosa. Real-time polymerase chain reaction (PCR) revealed that the high transcript abundance in developing and mature xylem may indicate their important role in secondary cell wall formation. Subsequently, we detected nucleotide diversity and LD decay within this gene family. SNP- and haplotype-based association tests were then used to examine allelic variation with putative function on growth and wood-property traits in both association (discovery) population and linkage (validation) population studies on P. tomentosa. The comprehensive study of PtoSAHH family members improves our understanding of the regulatory mechanism of the gene family in secondary cell wall formation. Two full-length cDNAs from PtoSAHHA and PtoSAHHB were isolated from a cDNA library prepared from the mature xylem zone of P. tomentosa using reverse transcription (RT)-PCR amplification. Two complete sequences were deposited in GenBank under Accession Nos. KF467170 and KJ198848, and consisted of the 5' terminal untranslated region (UTR) of 229 bp and 129 bp, the 3'-UTR of 248 bp and 181 bp, and coding regions of 1,968 bp and 2,131 bp, respectively. An equal open reading frame (ORF) of 1,458 bp was found that encoded a polypeptide of 485 amino acids in both PtoSAHHA and PtoSAHHB (Table 1). These two PtoSAHH cDNAs shared 88.8% nucleotide sequence identity, and were 81.7% and 80.7% identical, respectively, to AtSAHH (AY150471.1). The predicted molecular weight of PtoSAHHA and PtoSAHHB were 53.17 kDa and 53.36 kDa (Table 1), respectively, which were approximately equivalent to proteins of SAHH in other plants. PtoSAHHA and PtoSAHHB showed high similarity (90.1-98.1%) with SAHHs from P. trichocarpa, Arabidopsis, cotton, rice, and maize. Next, a genomic scale search revealed gene structures of PtoSAHHA and PtoSAHHB (GenBank Accession Nos. KF467171 and KJ198849), as shown in Figure 1. The two full-length genomic sequences (2,445 bp and 2,441 bp) consisted of two exons (711 bp and 747 bp in both PtoSAHHA and PtoSAHHB) separated by one intron (510 bp in PtoSAHHA and 673 bp in PtoSAHHB). Introns started with a 5' G-T and ended with a 3' A-G, which were in accordance with the GT-AG rule for a splice site. The two genomic DNAs shared high sequence similarity at the nucleotide level (80.4%). Exon-intron structure of PtoSAHHA and PtoSAHHB. Exons are shown in black boxes. Lines between boxes indicate introns. Gray boxes represent upstream and downstream. Blast analysis indicated that the deduced amino acid sequences of PtoSAHHA and PtoSASHHB shared high homology with the SAHH of other model plants (Figure 2), suggesting they should be members of this protein family. Like any other SAHHs of P. trichocarpa, Arabidopsis, cotton, rice, and maize, both PtoSAHHs contained one characteristic AdoHcyase NAD-binding domain and two transmembrane domains at residues 63-86 and 251-271 (Figure 2). Using ExPASY-PROSITE software (http://www.expasy.org/prosite/), two SAHH signature motifs were predicted near the transmembrane domains at residues 85-99 and 262-279 (Figure 2). Protein sequence alignment of PtoSAHHA and PtoSAHHB with other plant PtoSAHHs. Numbers on the right represent positions of amino acids in each protein. Transmembrane domains (A and C) are shaded. SAHH signature motifs (B and D) are indicated in boxes. NAD-binding domain is underlined. Detailed information on these genes is presented in Table 5. To analyze the evolutionary relationship between poplar SAHH proteins and SAHHs from other plants, a rooted neighbor-joining (NJ) tree was constructed using a multiple sequence alignment of poplar SAHH proteins and sequences from additional plants, including dicotyledons (P. trichocarpa and A. thaliana) and monocotyledons (Oryza sativa and Zea mays), as well as lower plants, such as Chlorella variabilis and Dunaliella salina (Table S1 in Additional file 1). As shown in Figure 3, 28 SAHH sequences formed two monophyletic groups, terrestrial and aquatic plants, with well-supported bootstrap values. Further subdivisions showed that the terrestrial groups could be classified into monocotyledons and dicotyledons (Figure 3), suggesting that SAHHs split off before the divergence of monocots and dicots ~200 million years ago . The pattern of PtrSAHHA/PtoSAHHA and PtrSAHHB/PtoSAHHB suggests that the SAHHs were split off prior to the divergence of interspecies in Populus. Neighbor-joining phylogenetic tree of SAHH family members. Detailed information on all protein species is presented in Table 5. Transcript accumulation of PtoSAHHA and PtoSAHHB was profiled by real-time quantitative RT-PCR to compare steady mRNA levels in various organs and tissues of P. tomentosa (Figure 4) with gene-specific primers (Table S2 in Additional file 1). 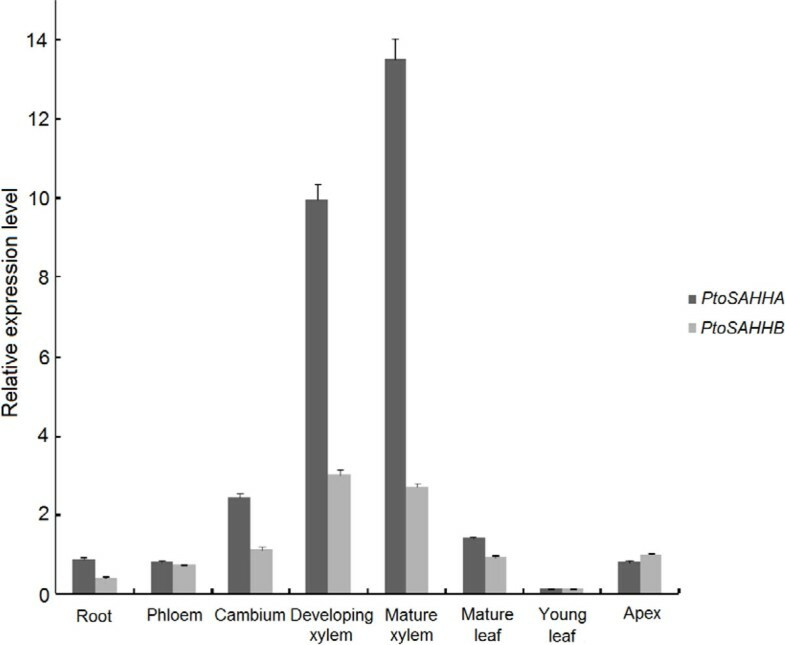 Transcript abundances of the two genes accumulated preferentially in the developing xylem and mature xylem, and gave similar profiles overall (Figure 4). PtoSAHHA transcript levels were highest in mature xylem (13.51) and developing xylem (9.97), and also high in cambium (2.441) and mature leaf (1.403). Compared with PtoSAHHA, PtoSAHHB showed less transcript accumulation profiles across all organs and tissues examined. The transcripts of PtoSAHHB were predominantly detectable in developing xylem (3.031) and mature xylem (2.696). Medium levels of expression were found in cambium (1.132), apex (0.9879), and the mature leaf (0.9395). In the young leaf, both PtoSAHHA and PtoSAHHB showed the lowest expression levels (0.1143 and 0.1345). Given the results described above, the higher expression levels of the two genes in the developing xylem imply that PtoSAHHA and PtoSAHHB may significantly contribute to cell wall thickening in wood. Relative transcript abundance of PtoSAHHA and PtoSAHHB in tissues and organs. Expression levels were normalized to the mean value of actin. Genomic sequences of PtoSAHHA and PtoSAHHB, ~2,445 bp and ~2,441 bp in length, respectively, were isolated from 43 unrelated individuals encompassing nearly the entire natural range of P. tomentosa. All 86 sequences from PtoSAHHA and PtoSAHHB identified in 43 unrelated individuals were deposited in GenBank databases (KF467172-KF467214 and KJ198849-KJ198891). Statistical analysis of nucleotide variation (excluding indels) over various regions of PtoSAHHA and PtoSAHHB are summarized in Table 2. In total, 326 SNPs were found in the 4,886 bp sequenced from the two genes (166 from PtoSAHHA and 160 from PtoSAHHB), or one SNP every 15 bp. The distribution of SNP frequencies in various gene regions are as follows: 13 bp-1 in the 5'-UTR, 16 bp-1 in exons, 12 bp-1 in introns, and 16 bp-1 in the 3'-UTR of PtoSAHHA; 14 bp-1 in the 5'-UTR, 18 bp-1 in exons, 11 bp-1 in introns, and 14 bp-1 in the 3'-UTR of PtoSAHHB. The two genes displayed a lower SNP density in coding regions compared to noncoding regions, suggesting that the coding region is conserved relative to other regions under natural pressure. Regions containing indels were excluded from the calculation; the standard deviations (SD) of πT was not shown in this table; aTotal silent = synonymous plus noncoding sites; bTotal = silent sites plus nonsynonymous sites. 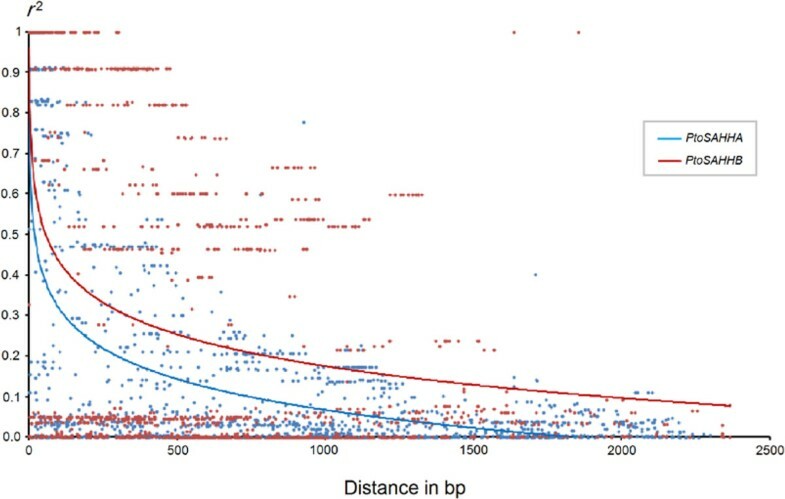 Nucleotide diversity was calculated using the average number of nucleotide differences per site between two sequences (π) and the population mutation parameter (θ) for each gene separately per region, as well as overall. In general, both PtoSAHHA and PtoSAHHB showed high nucleotide diversity with π = 0 . 01059 ± 0 . 00122 and 0 . 00930 ± 0 . 00079 , and θ = 0 . 01574 ± 0 . 00312 and 0 . 01523 ± 0 . 00288 , respectively (Table 2). Nucleotide diversity of different gene regions varied significantly in that π ranged from 0 . 00710 ± 0 . 00092 (exon 1) to 0 . 01766 ± 0 . 00172 (5'-UTR) in PtoSAHHA, and from 0 . 00248 ± 0 . 00067 (exon 2) to 0 . 01772 ± 0 . 00135 (intron 1) in PtoSAHHB (Table 2). Based on all homologous DNA sequences data from different species (Table S1 in Additional file 1), within coding regions of SAHHAs and SAHHBs, the average of nonsynonymous nucleotide diversity ( d N , π = 0 . 00483 ± 0 . 00032 and 0 . 00988 , ± 0 . 00065 , respectively ) was 7.3- and 2.5-fold smaller than synonymous nucleotide diversity ( d S , π = 0 . 03510 ± 0 . 00120 and 0 . 02526 ± 0 . 00151 , respectively ) . The d N /d S values for exons were < 1, indicating strong purifying selection is involved in evolving SAHHs during species speciation. Of all the SNPs in PtoSAHHA and PtoSAHHB, 222 were singletons and 104 were common sites (frequency ≥ 0.05; Table 3). Further analysis revealed that 255 of 326 were transitions (78.2%) and 71 of 326 were transversions (21.8%); the ratio of transitions to transversions was 3.59:1 (Table 3). *Common SNPs representing the minor allelic frequency is ≥ 5%. Using nucleotide diversity data from both PtoSAHHA and PtoSAHHB, the results from within- or among-climatic region differentiation suggested similar patterns among πT, πsil, πsyn, and πnonsyn (Table 4), indicating that the level of selective constraint was similar among climatic regions. Tajima's D  and Fu and Li's D  statistics were used to determine whether a gene or genomic region was evolving randomly (neutral evolution) or under selection (non-neutral evolution). No significant departures from the neutral evolution were identified using Tajima's D among all three climatic regions and the whole P. tomentosa population in both PtoSAHHA and PtoSAHHB (Table 4). Fu and Li's D statistical tests were negative for all three regions and the whole population in both genes, with significant departure observed in the whole population (P < 0.05; Table 4), revealing an excess of low-frequency polymorphisms in the species-wide samples. Indeed, 113 of 166 variants in PtoSAHHA and 109 of 160 variants in PtoSAHHB were singletons, accounting for 68.07% and 68.13%, respectively, of the total segregation sites (Table 4). N = Number of sequences sampled; S = number of segregating sites; πtot = average nucleotide diversity in the full-length gene; πsil = average nucleotide diversity in synonymous and noncoding sites, πs = average nucleotide diversity of synonymous mutations; πn = average nucleotide diversity of nonsynonymous mutations; *P <0.05. The nonlinear regression model for analyzing the decay of LD with distance showed that LD decayed quite rapidly with distance when total informative SNPs of PtoSAHHA and PtoSAHHB were used. However, LD decayed quickly within PtoSAHHA, with r2  dropping below 0.1 within ~800 bp (Figure 5), indicating that LD did not extend over the entire gene region. However, PtoSAHHB showed an extensive LD level over distance approaching the full length of the gene region (r2 > 0.1, within 2,200 bp; Figure 5). Decay of linkage disequilibrium within PtoSAHHA and PtoSAHHB in the natural population. Pairwise correlations between SNPs were plotted against the physical distance between SNPs (bp). Curves describe the nonlinear regression of r2 (Er2) onto the physical distance (bp). In the association (discovery) population, 1,040 tests (104 SNPs × 10 traits) in PtoSAHHA and PtoSAHHB were conducted with 104 permutations using a mixed linear model (MLM). Results of single-marker associations for each of the 10 phenotypic traits are presented in Table S3 in Additional file 1. In total, 29 significant associations with 10 traits were identified at the threshold of P < 0.05 (Table S3 in Additional file 1). However, following correction for multiple testing with a significance level of Q <0.10, the total number of significant associations was reduced to eight (Table 5). These eight associations representing eight unique SNPs from the exon, intron, and 3'-UTR regions of PtoSAHHA and PtoSAHHB, were significantly associated with five wood traits, including α-cellulose, holocellulose, fiber length, tree height (H), and stem volume (V) (Table 5). The loci explained a small proportion of the phenotypic variance, ranging from 1.73% to 4.00% (Table 5). Of these markers, both PtoSAHHB_1065 from intron 1 and PtoSAHHA_2203 from the 3'-UTR showed significant association with α-cellulose content. Similarly, PtoSAHHA_1196 and PtoSAHHA_1028 from intron 1 were both significantly associated with holocellulose content, whereas PtoSAHHB_618 from exon 1 and PtoSAHHA_1313 from intron 1 showed significant association with H (Table 5). Among these eight SNPs in PtoSAHHA and PtoSAHHB, one represented synonymous substitution, two were nonsynonymous, and others were located in UTRs (Table 5). Silent SNPs were not considered as potential false positives a priori since they may affect transcript level and codon usage [27, 28]. 1Alleles of parents [female : male]. All eight significant SNPs identified in the discovery population were in accordance with Mendelian expectations (P ≥ 0.01), and no novel allele was discovered in the linkage (validation) population. Consequently, 80 tests (8 SNPs × 10 traits) were conducted in the validation population, and five marker-trait associations were observed (P < 0.05; Table 5). After correcting for multiple testing (Q <0.10), only three significant markers were validated, including PtoSAHHA_2203, PtoSAHHB_410, and PtoSAHHB_1065, and the proportion of phenotypic variation was 3.60%, 3.00%, and 2.83%, respectively. Comparisons of genotypic effects for the same significant association examined in discovery and validation populations are shown in Figures 6 and Figure 7. As a result, the effects of different genotype classes in the noncoding markers PtoSAHHB_1065 (AA, AG) and PtoSAHHA_2203 (GG, GT, TT) were similar in both populations for α-cellulose content. The nonsynonymous marker PtoSAHHB_410 from exon 1 of PtoSAHHB, which results in an amino acid change from His to Arg, was significantly associated with fiber length. In addition, the effects of different genotype classes (GG, GA, AA) for fiber length were also similar in both populations (Figure 7). Moreover, PtoSAHHB_410 is located in a region of the SAHH protein that is predicted to be involved in an active functional domain. Haplotype and single-marker associations with α-cellulose content for PtoSAHHA. Genotypic effect of the significant haplotype PtoSAHHA_2203-2222 (Q < 0.10) within PtoSAHHA is shown. The genotypic effect for single marker PtoSAHHA_2203 (Q < 0.10) is also revealed in both association and linkage populations. Haplotype and single-marker associations with fiber length and α-cellulose content for PtoSAHHB. Effects of the significant haplotype (Q < 0.10) within PtoSAHHB. Marker effects of PtoSAHHB_410 and PtoSAHHB_1065 are also shown in both association and linkage populations. PtoSAHHB_410 is associated with fiber length, while PtoSAHHB_1065 is associated with α-cellulose content (Q < 0.1). To additionally dissect the allelic variations of the SNP identified in single-marker association analysis, we also tested the associations using a haplotype-based method in the discovery population. In total, 26 significant block sets (r2 ≥ 0.7, P < 0.0001) were analyzed with each of the 10 traits, and the number of common haplotypes (frequency ≥ 5%) per set varied from 2 to 6, with an average of 3.0. After multiple test corrections, eight significant blocks containing 14 significant haplotypes (Q < 0.10; Table S4 in Additional file 1) in PtoSAHHA and PtoSAHHB were associated with five traits, including α-cellulose content, holocellulose content, hemicellulose content, fiber width, diameter at breast height (DBH), and H, and many were strongly supported by single marker- association results (Tables 5 and S3). We also found that the haplotype block sizes for these significant SNPs were smaller in validation population than in the discovery population (Detail not shown). SAHH is a key enzyme in the maintenance of methylation potential in cells [12, 29]. Inhibition of this enzyme causes increased accumulation of SAH, resulting in suppression of the methylation pathway via a feedback inhibition mechanism. 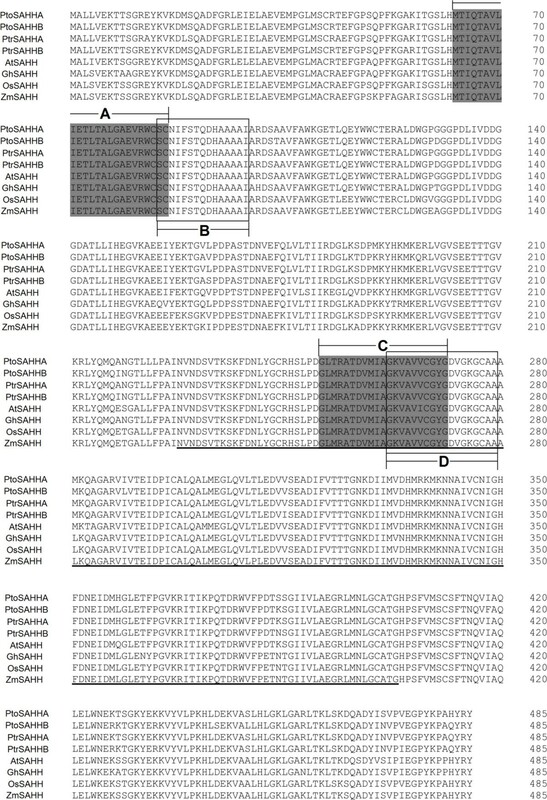 In this study, two SAHHs encoded by PtoSAHHA and PtoSAHHB were determined to contain two active domains and a cofactor binding domain (NAD-binding domain; Figure 2), which is in accordance with the expected conserved features of SAHHs identified in other species. SAHHs belong to the larger family of NAD(P)H/NAD(P)+-binding proteins that share a Rossmann-fold, and the NAD(P)H/NAD(P)+-binding domain is found in numerous dehydrogenases as well as other redox enzymes, but is rather unusual for a hydrolase [30, 31]. Therefore, the two functional domains (Figure 2) were predicted to catalyze the hydrolysis of SAH and thereby increase methylation efficiency . In an early investigation, SAHH was found to be present in a cytokinin-binding protein complex isolated from tobacco leaves; therefore, the enzyme was proposed to be a cytokinin-binding protein . Other studies demonstrated that downregulation of SAHH affected the expression of cytokinin pathway genes, and cytokinin positively regulated the transmethylation cycle and DNA methylation based on an analysis of a T-DNA mutant and transgenic RNAi plants . Natural cytokinins are adenine derivatives that regulate numerous aspects of plant growth and development, stem growth and branching, leaf senescence, light signal transduction, and stress tolerance. Thus, SAHH appears to coexpress with cytokinin-related genes in plant growth and development. Xylogenesis is one of the most remarkable examples of irreversible plant cell differentiation. This process is controlled by a wide variety of factors both exogenous (photoperiod and temperature) and endogenous (phytohormones), and through an interaction between them [35, 36]. The role of phytohormones in procambium initiation, cambial cell division, primary cell wall expansion, and secondary wall formation has been reviewed by Sundberg  and Mellerowicz . Recent findings have demonstrated the existence of an auxin (indole-3-acetic acid, IAA) gradient across the developing vascular tissues of pine and poplar, and other hormones have been shown to be involved in xylogenesis by interacting with IAA in a synergetic (gibberellins, cytokinins, and ethylene) or inhibitory (abscisic acid) manner . Consistently, PtoSAHHs from P. tomentosa may affect secondary cell wall formation by influencing the cytokinin content [33, 40]. SAHH is one of the most highly conserved biosynthetic enzymes in the process of evolution , which is consistent with our finding that the two PtoSAHH proteins were in the same subgroup of the phylogenetic tree (Figure 3). This high level of sequence conservation is astonishing and highlights the important cellular function of the enzyme. Intracellular SAHH can regulate gene expression by affecting cytokinin content and DNA methylation status, thereby regulating plant growth and development [33, 42]. In this study, PtoSAHHA and PtoSAHHB were originally isolated from a mature xylem cDNA library of P. tomentosa, and both were determined to share xylem-specific expression patterns (Figure 4), demonstrating that PtoSAHHs are likely associated with secondary cell wall development and may further participate in stem growth and wood formation. Poplars are a model species for studies of angiosperm trees, provide data for comparison of a long-lived perennial to short-lived model plants (e.g., Arabidopsis, rice), but also offer new opportunities to explore the genetic basis of wood formation, perenniality, and dormancy [43, 44]. Considering the important role of poplars, the identification of genes and allelic variants controlling growth and wood quality is important for forest tree breeding programs with a practical importance in production. Association mapping can detect functional allelic variation underlying quantitative traits, and these significant markers can be used for marker-assisted breeding. A set of candidate gene SNP associations was identified with chemical wood properties in related Populus species [45–47]. In this study, three single-marker associations and 14 haplotypes within PtoSAHHs were significantly associated with wood quality and growth traits (Tables 5 and S4), which demonstrate that PtoSAHHs may further participate in stem growth and wood formation. PtoSAHHB_1065 (located in intron 1 of PtoSAHHB) was significantly associated with α-cellulose content in both discovery and validation populations. Correspondingly, the significant haplotype-based associations (PtoSAHHB_1028-1035-1065) with α-cellulose in the discovery population suggest that this locus may be closely located to causative polymorphisms. This conjecture is supported by significant phenotypic differences in various genotype classes of PtoSAHHB_1065 in both populations (Figure 7). Consistently, PtoSAHHA_2203 (located in the 3'-UTR of PtoSAHHA), with two haplotype-based associations (PtoSAHHA_2203-2222), was also significantly associated with α-cellulose content in both populations. SNPs in noncoding regions (5′-UTR, 3'-UTR, and intron) could influence phenotypic traits because these regions play an important role in regulating gene expression. 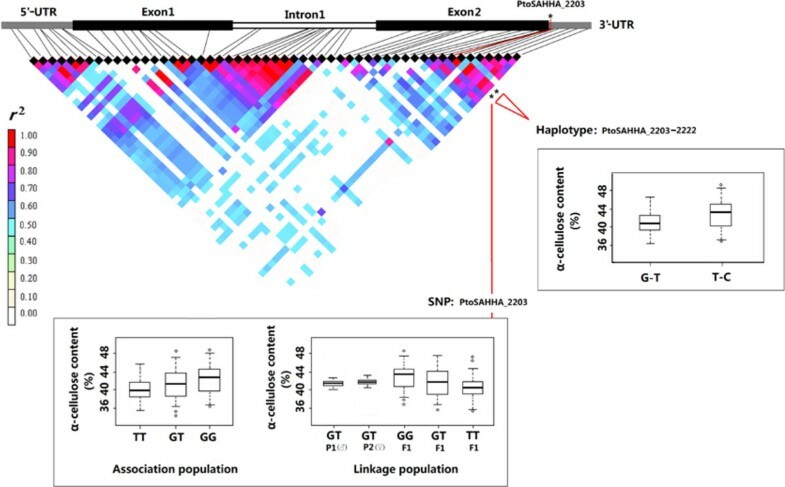 Specifically, SNPs in introns could affect phenotypic traits because those particular introns may play an important role in regulating gene expression and exon splicing; although mutation of the 3'-UTR did not result in an amino acid change, it may regulate expression of the gene; and SNPs in 5′-UTRs can affect mRNA stability, translational efficiency, or subcellular localization [48, 49]. Previous studies have determined that SNP loci in noncoding regions are significantly associated with wood traits. For example, González-Martínez  detected a strong association between SNP M10, located in intron 1, and earlywood microfibril angle in Pinus taeda. Fang  detected a novel SNP in the 3' flanking region of the goat BMP-2 gene, which is associated with growth traits. Similarly, an SNP in the 5'-UTR of Eni-HB1 associated with microfibril angle was identified in Eucalyptus nitens . In addition, two SNPs located in the 5'-UTR of TUB15 were associated with lignin content in Populus nigra . A nonsynonymous substitution in exon 1 of PtoSAHHB (PtoSAHHB_410) was strongly associated with fiber length using single-marker association. No haplotype was found there, demonstrating that PtoSAHHB_410 is a unique functional locus. The G allele is the minor allele of this nonsynonymous marker, which represents a missense mutation causing a His→Arg substitution. Fibers, the most abundant secondary wall-containing cells in woody species, are mainly controlled by the endogenous regulation of cell elongation and expansion [53–55]. During secondary wall formation, highly coordinated expression of multiple genes controls cell elongation and secondary wall thickening of fibers [56–58]. For example, a mutant allele of AtCesA7 in fragile fiber 5 (fra5) causes a severe decrease in cellulose content and fiber thickness . AtCesA7/IRX3 and AtCOBL4/IRX6 are coexpressed in tissues during secondary cell wall development, and loss-of-function mutants of either of these genes show diminished cellulose content and loss of mechanical strength of the plant body . From the results described above, we inferred that PtoSAHHB_410 may be a functional mutation that is in or near a causative locus involved in fiber morphology. Further analysis of the protein structure encoded by PtoSAHHB revealed that the nonsynonymous mutation of amino acid 94 (His→Arg) is within the SAHH signature motifs (at residues 85-99) and close to the putative transmembrane domains (TMDs; at residues 63-86; Figure 2), suggesting that this nonsynonymous locus may affect the enzymatic activity of SAHH signature motifs and also influence gene expression related to fiber length. Therefore, expanding our understanding of the action of PtoSAHHB is essential. Wood formation mainly includes deposition of strong secondary cell walls that contain cellulose microfibrils, lignin, and other components. Many studies have examined the molecular biology of secondary cell wall biosynthesis and have shown that the complex, dynamic process of secondary wall formation requires the coordinate regulation of diverse metabolic pathways involving polysaccharides and lignin. Furthermore, the incorporation of association studies by using more genes in shared biosynthetic pathways or the whole genome-wide level would provide a more complete dissection of genetic variance for the growth and lignocellulosic traits. The finding can be applied to marker-assisted breeding. SAHH is a key enzyme in the maintenance of methylation potential in cells, and can further affect plant growth and development. This study first identified SAHH family (PtoSAHHA and PtoSAHHB) from P. tomentosa, and the high level of sequence conservation of encoded proteins indicated the crucial function of the SAHH family. 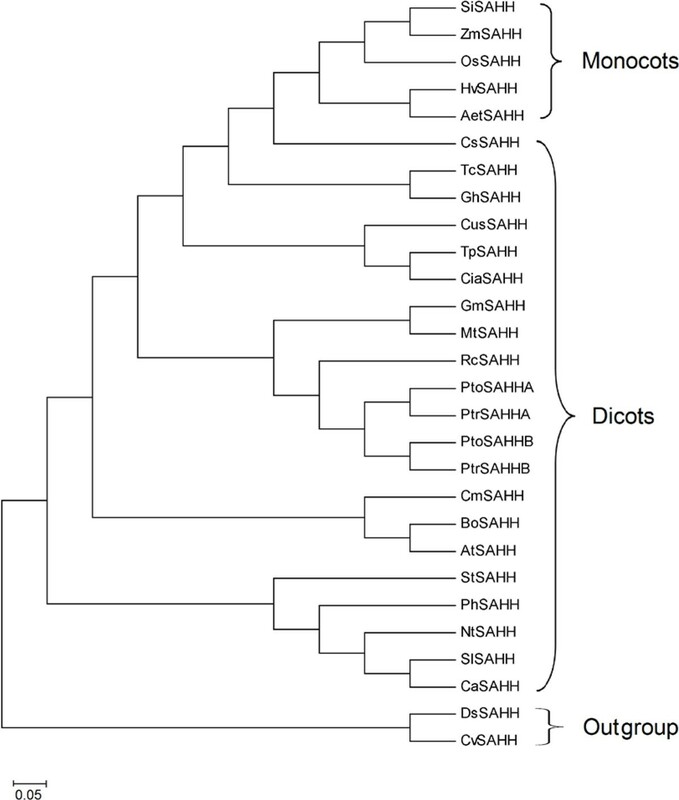 Phylogenetic analyses demonstrated that all plant SAHHs were split off before the divergence of monocots and dicots ~200 million years ago, and the PtoSAHH members were split off prior to the divergence of interspecies in Populus. Tissue-specific expression profiles of the PtoSAHH family revealed similar expression patterns, with high expression in the xylem, indicating putative functional roles in wood formation. Subsequently, single-marker and haplotype-based association tests (using a discovery population), as well as linkage analyses for validation, demonstrated two noncoding SNPs and corresponding haplotypes that were remarkably associated with the α-cellulose content; one nonsynonymous SNP showed significant association with fiber length. We inferred that the nonsynonymous SNP (PtoSAHHB_410) may be a functional mutation that is in or near a causative locus involved in fiber morphology. In conclusion, the present study offers a theoretical basis for better understanding the regulatory mechanism of the PtoSAHH family in secondary cell wall formation. Discovery population: In 1982, a clonal arboretum of P. tomentosa was established in Guan Xian County, Shandong Province, China (36°23′N, 115°47′E), which contained 1,047 unrelated individuals from the entire nature distribution region (~1 million km2) of P. tomentosa. The distribution zone can be divided into three climatic regions: Southern (S), Northwestern (NW), and Northeastern (NE), by the methods of principal components analysis and isodata fuzzy cluster of 16 meteorological factors . Unrelated P. tomentosa individuals were randomly selected from the clonal arboretum for identifying SNPs and association studies (43 and 460, respectively). Validation population: In 2008, 5,000 F1 hybrid progeny established by controlled crossing between two elite poplar parents, clone "YX01" (P. alba × P. glandulosa; female) and clone "LM 50" (P. tomentosa; male), were grown in the Xiao Tangshan horticultural fields of Beijing Forestry University, Beijing, China (40°2′N, 115°50′E). For future validation of significant associations identified in a discovery population, 1,200 individuals were randomly selected from 5,000 F1 progeny, which composed the validation population. Phenotypic data: In discovery and validation populations, 10 quantitative phenotypic traits were scored with at least three ramets per genotype. These 10 traits included growth characteristics (H, DBH, and V) and wood properties (fiber length, fiber width, microfiber angle, holocellulose, hemicelluloses, α-cellulose, and lignin contents), and the distributional values of each trait were approximately consistent with a normal distribution. Details of the sampling and measurement methods, phenotypic variance, and Pearson's correlations for these 10 traits have been reported previously [47, 60]. Using the Plant Qiagen RNeasy kit, RNA from the mature xylem stem tissue of a P. tomentosa (clone "LM50"; 1-year-old) was extracted and then reverse transcribed into cDNA with the SuperScript First-Strand Synthesis system (Life Technologies, Carlsbad, CA, USA). The P. tomentosa stem mature xylem cDNA library was constructed, which was generated as a part of our large-scale effort to identify genes expressed predominantly in the mature xylem of P. tomentosa stems. The cDNA library was composed of 5.0 × 106 pfu with an insert size of 1.0-4.0 kb. Subsequently, random end-sequencing of 5,000 cDNA clones and comparison with all available Arabidopsis SAHH sequences revealed that 10 clones were highly similar to AtSAHH. Finally, with these expressed sequence tag (EST) sequences, one contig was assembled representing a full-length cDNA. Next, the BLAST program (JGI database) was used to analyze the ESTs. Two full-length cDNAs of SAHH were detected from P. trichocarpa. Based on these two cDNAs, gene-specific primers were designed and two full-length cDNAs of SAHH from P. tomentosa were isolated (PtoSAHHA and PtoSAHHB). Using the Plant DNeasy kit, total genomic DNA was extracted from fresh young leaves of each individual P. tomentosa in accordance with the manufacturer's protocol (Life Technologies). For sequencing the genomic DNA of PtoSAHH, specific primers were designed based on the two cDNA sequences. PCR amplification was performed according to the procedure described by Du . Next, PCR products were resolved by agarose gel electrophoresis, excised, and purified using Ultrafree®-DA (Millipore, Billerica, MA, USA) centrifugal filter units. Purified DNA was then ligated into the pGEM®-T Easy Vector and transformed into JM109 competent cells (Promega, Madison, WI, USA). Plasmid DNA was isolated from overnight cultures using the QIAprep Spin Miniprep protocol (Qiagen, Valencia, CA, USA) and sequenced on both strands with conserved T7 and SP6 primers using the BigDye™ Terminator Cycle Sequencing Kit (version 3.1; Applied Biosystems, Foster City, CA, USA) and a 4300 DNA Analyzer (Li-Cor Biosciences, Lincoln, NE, USA). The Gene Structure Display Server (GSDS) program (http://gsds.cbi.pku.edu.cn/) was used to represent the gene structure schematic diagrams of PtoSAHHA and PtoSAHHB after submitting coding and genomic sequences. Multiple sequence alignments and an unrooted phylogenetic tree of the amino acid sequences of SAHH in monocotyledons, dicotyledons, and algae were generated using the NJ method of MEGA version 5.05, and statistical confidence of the tree nodes was based on 1,000 bootstrap replicates. SAHH gene sequences in Arabidopsis, P. trichocarpa, rice, maize, and cotton were identified by searching public databases available at NCBI (http://www.ncbi.nlm.nih.gov) . Total RNA was extracted from at least three individual samples of all fresh tissues (root, stem phloem, stem cambium, stem immature xylem, stem mature xylem, young leaf, mature leaf, and apical shoot meristem) collected from a 1-year-old P. tomentosa clone, "LM50." Additionally, RNA was extracted using the Plant Qiagen RNAeasy Kit according to the manufacturer's instructions (Qiagen). Purified RNA was treated with DNaseI using the RNase-Free DNase set (Qiagen). Finally, RNA integrity was confirmed on an agarose gel. RNA was then reverse transcribed into cDNA using the SuperScript First-Strand synthesis system and the supplied polythymine primers (Invitrogen, Carlsbad, CA, USA) . All cDNA samples were used for testing tissue-specific expression of PtoSAHHA and PtoSAHHB. Using the PtoSAHH-specific and internal control (Actin) primer pairs designed by Primer Express 3.0 software (Applied Biosystems), the cDNA (2 μL) of all fresh tissues was amplified in a reaction containing 12.5 μL of QuantiTect SYBR Green PCR reagent (Qiagen), 0.5 μL each of 10 nM forward and reverse primers, and 9.5 μL of water. Amplification was performed on a 7500 Fast Real-Time PCR System (Applied Biosystems). Real-time quantitative PCR and the generated real-time data were performed according to the procedure described by Zhang . All reactions were performed in triplicate for technical and triplicate biological repetitions of three plants, respectively, and the results were standardized to actin. To identify SNPs within PtoSAHHA and PtoSAHHB, the two full-length genes were sequenced and analyzed in 43 unrelated individuals from the discovery population. Multiple sequence alignment was analyzed using DNA sequence polymorphism (DNASP) software version 5.10 . Insertions and deletions (indels) were excluded from all estimates. Next, 78 common SNPs (minor allele frequencies ≥ 0.05, 42 SNPs from PtoSAHHA and 36 from PtoSAHHB) were genotyped by the single-nucleotide primer extension method with a Beckman Coulter (Franklin Lakes, NJ, USA) sequencing system across all DNA samples. Additionally, DNASP software version 5.10 was used to calculate summary statistics for nucleotide diversity and divergence. Nucleotide diversity was estimated by θw from the number of polymorphic segregating sites [65, 66], and by π from the number of pairwise differences per site between sequences . In addition, the diversity statistics of noncoding, synonymous, and nonsynonymous sites, and neutrality test statistics, Tajima's D* , and Fu and Li's D*  of three climatic regions were also calculated. To estimate if natural selection (purifying selection or positive selection) is involved in evolving this enzyme during species speciation, we do dN/dS analysis (between species) with all homologous DNA sequences data from different species (Table S1 in Additional file 1). LD descriptive statistics (r2) are affected by both recombination and differences in allele frequencies between sites . To assess the extent of LD within the sequenced PtoSAHHA and PtoSAHHB regions, the decay of LD with physical distance (base pairs) between informative SNPs within genes was estimated by nonlinear regression analysis . Singletons were excluded in LD analyses, and the significance level for LD was determined through 10,000 permutations. SNP association models: Associations between 10 traits and 78 common SNP markers of PtoSAHH (42 from PtoSAHHA and 36 from PtoSAHHB) in the discovery population (460 individuals) were tested via the MLM implemented in TASSEL ver. 2.0.1. The MLM can be described as follows: y = µ +Qv+ Zu + e, where y is a vector of phenotype observation, µ is a vector of intercepts; v is a vector of population effects; u is a vector of random polygene background effects; e is a vector of random experimental errors; Q is a matrix defining the population structure, and Z is a matrix relating y to u. For Var (u) = G =σ 2 a K with σ 2 a as the unknown additive genetic variance and K as the kinship matrix . In the MLM model, the kinship matrix was built using the SPAGeDi version 1.2 software , and the population structure matrix was identified based on significant subpopulations . Failure to appropriately adjust for multiple testing may produce excessive false positives or overlook true positive signals in association studies when using large numbers of SNPs. To correct for multiple tests, the positive false discovery rate (FDR) method was used to identify significant SNPs after correction using QVALUE software, version 1.0 . Haplotype-based association analysis: Haplotypes were inferred and haplotype-based association tests with growth and wood quality were performed using haplotype trend regression software . Haplotype association significance was based on 1,000 permutation tests. Singleton alleles and haplotypes with a frequency <5% were ignored when constructing the haplotypes. A correction for multiple tests was performed using the positive FDR method. Publication of this work was supported by grants from the State Key Basic Research Program of China (No. 2012CB114506), and Program for Changjiang Scholars and Innovative Research Team in University (No. IRT13047), and the Projects of the National Natural Science Foundation of China (No. 31170622, 30872042). Qingzhang Du, Lu Wang contributed equally to this work. Conceived and designed the experiments: DZ. Performed the experiments: LW DZ QD WP HY CG. Analyzed the data: QD DZ WP CG LW. Contributed reagents/materials/analysis tools: QD DZ LW DZ. Wrote the paper: QD WP DZ.